Two pillars fundamental to Australia’s survival are education and export income; the May budget apparently does not recognise this fact. Today, comment will be confined to the education budget while the June contribution will examine the budget implications for Australia’s export income. Before discussing budget issues it is useful to recognise where Australia is situated vis-a-vis global education standards and our national degree of preparation to embrace the current reality of automation and artificial intelligence. On education standards the OECD (March 2015) league tables indicate Australia ranks 14th behind Poland, Vietnam and Germany. Australia ranks 19th behind the United States and United Kingdom in secondary school enrolment rates. 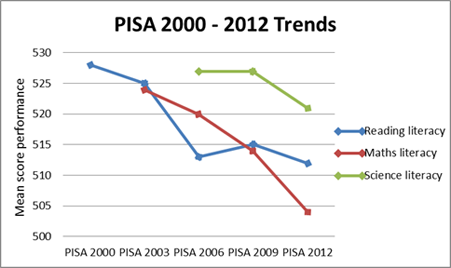 The Program for International Students Assessment (PISA) shows a striking decline for Australia between years 2000 and 2012 – for Maths down from 6th to 19th, Science from 8th to 16th and Reading down from 4th to 13th. The results speak for themselves. However, the burning question is – are competitor countries improving or is Australia just getting worse? At the Davos Economic Forum in January, the Committee on Artificial Intelligence noted Australian business is not ready to embrace the concept or the mathematics of artificial intelligence. The rate of Australian skills uptake and its poor grasp of STEM subjects increases the risk of its industry becoming uncompetitive. In recent years Professor Chubb, former Chief Scientist, frequently mentioned Australia’s serious STEM deficit. Teachers must obtain a Masters degree or higher. Teaching must be raised to the status of the medical and legal professions. The fractious State Education Departments must be replaced by a unified Federal system. Australian parents must exert greater discipline on home studies. Universities must be recognised as integral to Australia’s future and funded to recognise their export reality and innovation potential. In assessing the OECD rankings of other countries, it is relevant to know which operate under a unified education system. 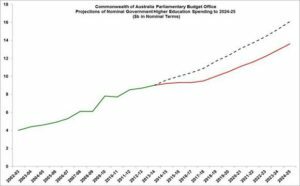 Endeavouring to read between the lines of the Budget discussions, the Budget does not appear to be addressing Australia’s fundamental education problems. There will be an attempt to halt declining academic standards. 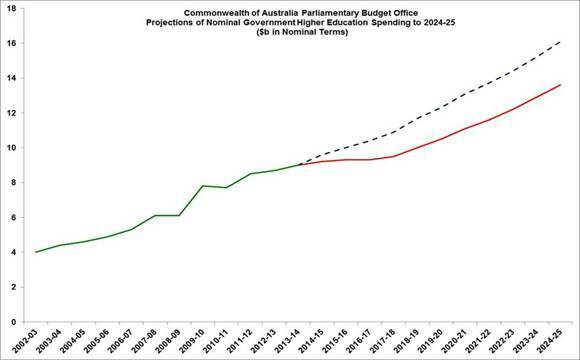 This policy will be funded by an $81.1 billion expenditure over four years boosted by $18.6 billion over ten years. Professor Gonski has been reappointed to decide on expenditure priorities and to direct the program. From this, it implies the Government is unsure of its own priorities. The School Reserve Standard (SRS) grants seek to ensure all schools provide education on a level playing field, an important issue but on its own will have little effect on overall ranking. NSW – is attempting teacher improvement through a ‘Great Teaching Inspired Learning’ initiative. Qld – is targeting teacher quality to attract the best and is introducing teacher training modules. SA – is offering 200 scholarships of $20,000 each towards Masters degrees. This appears to be attacking the root of the problem. WA – is providing more teacher training internships. Vic – is working on a policy to enhance teacher quality to improve student outcomes. Dr G Craven, President of the Catholic University and Chairman of the Federal Government Teacher Education Advisory Board, has provided an insight into the problem bedevilling the system. There is an obsession with new teachers which is that young motivated teachers are showing under-performing teachers in a bad light. This obsession is part of an ‘industrial surrender’ by the State Education Ministers, all preoccupied with the blame game instead of investing in education. There are education unions who do not wish to see innovation or improvement rolled out through the entire teacher population. The Federal Minister for Education, the Hon S Birmingham, supports Dr Craven’s comments under the mantra ‘Quality Schools – Quality Outcomes’. This would hopefully produce effective policy and changes to the industrial relations agreements which will link pay progression to nationally agreed professional standards. The initiatives of the State Education Departments will not solve the problem of Australia’s declining OECD rankings or STEM deficiency rankings. This problem will only be solved by raising the status and standards of teachers, amalgamating State education departments under a unified system, and learning from those countries that are more highly ranked. This problem cannot be solved during the life of a single parliament. The University of New South Wales Chancellor, Dr Ian Jacobs, (UNSW News Room, 9 May 2017) has commented that current Government policy on universities is not in Australia’s long term interest. The policy implies universities are an expenditure problem not a long term investment. A recent OECD global study indicated that six Australian universities were in the top one hundred in the world. A Deloitte study recently concluded university research accounts for 10% of Australian GDP, that is $160 billion per year. It is unsurprising Australia is in free fall on the OECD league tables. The funding history and current policy illustrate why. In 1974, the Commonwealth provided 90% of university income. By 2010 this had reduced to 42% and by 2014 it was 20% for the major research universities. 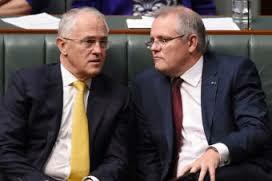 This hollowing out of a principal driver to the Australian economy has been supported by both Labor and Liberal to the present day. 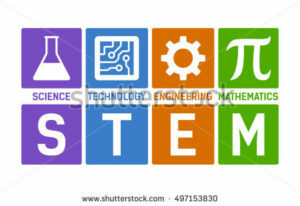 In 2016 the Government proposed a 20% funding cut in science, engineering, social science and arts education – this during a STEM controversy. The big picture is that Australian spending on higher education has remained static at 1.6% of GDP for some years while the figures for Canada and the United States is around 2.6 to 2.8% of GDP. Australian student fees are now the highest in the OECD – and that does not include the 2017 budget increase. This ‘penny pinching’ must be viewed against the value of export income derived from the value of international student education. 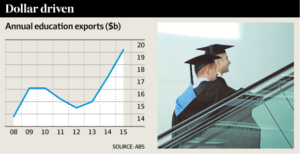 This constitutes Australia’s highest value services export and third most valuable export after coal and iron ore. Data published by the AFR (3 Feb. 2016) indicate Australia hosts 555,000 foreign students in a population of 1.3 million students, i.e. 46% worth, an amount of $19 billion which is ahead of tourism at $16 billion. Export income from students is increasing. Dr Jacobs further indicated that Australia’s high academic ranking and proven track record proves there is enormous potential for economic diversification and growth. This is being destroyed by short sighted budget cuts and proposed visa restrictions on well educated foreigners. It is a sad commentary when the Federal Government is in sync with One Nation on its policy to the entry of foreigners to Australia. NOT “jobs and growth” or “fairness, opportunity, security”.